The adidas Yeezy Boost 700 is on a new wave right now. The chunky silhouette has finally been widely available this year, and it appears that Ye and adidas are ready for more. Check out the adidas Yeezy Boost 700 “Salt” coming in 2019. The adidas Yeezy Boost 700 is just beginning its life cycle. This year held the widest release yet of the OG “Waverunner” colorway, as well as the debut of the new “Mauve” look. Additionally, the unreleased V2 version is rumored to release sometime in the coming months, though this rumor has been somewhat dormant in recent weeks. 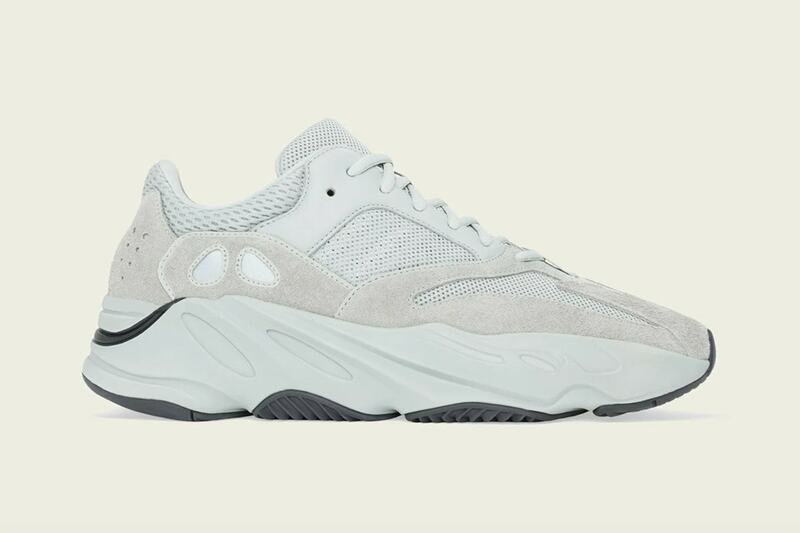 However, today the YeezyMafia took to Twitter to announce the release of yet another Yeezy Boost 700 V1 colorway. Similar to the latest adidas Yeezy release, the new 700 colorway is titled “Salt”. The Yeezy team has interpreted this name into a faded white tone, with a hint of green in some areas, similar to the Yeezy Boost 350 V1’s “Moonrock” colorway. The upper on this new Yeezy Boost 700 is dipped entirely in the subtle look and rests atop an all-white midsole. The outsole comes in black to provide some contrast to the shoe, along with a singular black hit on the heel of the sole. The next colorway in line for the adidas Yeezy Boost 700 is rumored to drop on February 23rd, 2019, though adidas has yet to confirm this date. The clean new “Salt” look will likely retail for the usual $300 price point from adidas and select retailers. Check out the official images below for a better look, and stay tuned to JustFreshKicks for more adidas Yeezy news.